Inserm Unit U919, directed by Prof. Denis Vivien (“Serine Proteases and Physiopathology of the Neurovascular Unit”) has developed an antibody with potential therapeutic effects against multiple sclerosis. 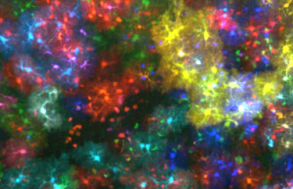 The study, directed by Fabian Docagne and published in Brain, paves the way for a new strategy to control the disease. Multiple sclerosis is a disease that affects the central nervous system, particularly the brain and spinal cord. It is the most common cause of neurological disability in young adults. The disease is considered autoimmune since the immune system, which is there to protect the body from external assault, attacks its own constituents. 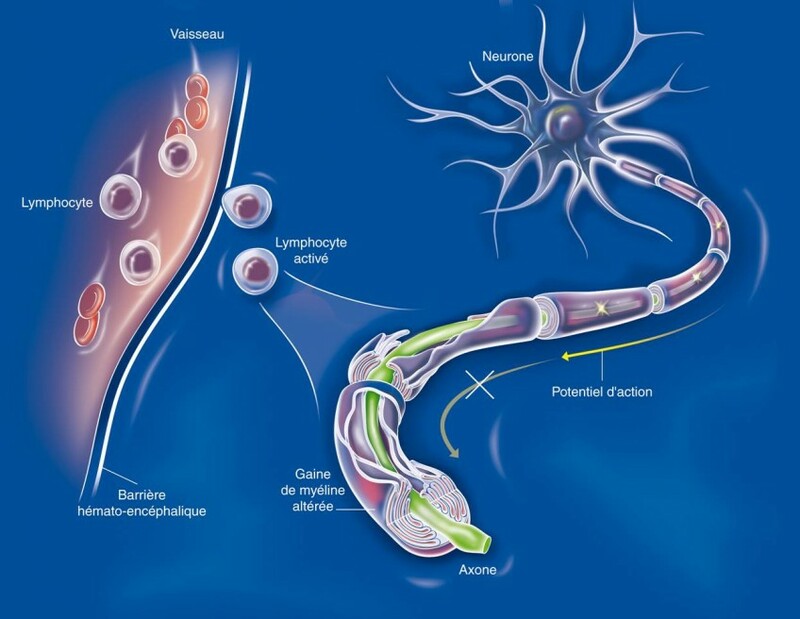 The cells of the immune system, particularly the lymphocytes, bring about the destruction of the myelin sheath that surrounds and protects the extensions (axons) of the neurons. This demyelination, which marks the beginning of axon degeneration, disrupts the transmission of nerve impulses. Lesions in the form of “plaques” are dispersed over the brain and spinal cord. They cause symptoms that vary greatly from one individual to another. Usually, the disease is characterised by exacerbations, with the appearance of motor, sensory and cognitive disorders, followed by remission a few weeks later. But with the passage of years, these symptoms can progress to irreversible disability. Current treatments reduce the exacerbations and improve the quality of life of patients, but do not control the progression of the disease. In order for the cells of the immune system circulating in the bloodstream to reach the central nervous system, they must penetrate the blood-brain barrier (haematoencephalic barrier) and blood-spinal cord barrier (haematomedullary barrier). 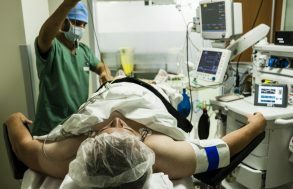 During previous work on a mouse model of stroke, the team from Inserm Unit 919 studied a factor involved in opening the blood-brain barrier, the NMDA receptor. In particular, they observed that blocking the interaction of this receptor with tPA (a member of the serine protease family) has beneficial effects associated with maintaining the integrity of the barrier. In this study, the researchers developed a strategy for blocking the interaction of tPA with the receptor, in multiple sclerosis. 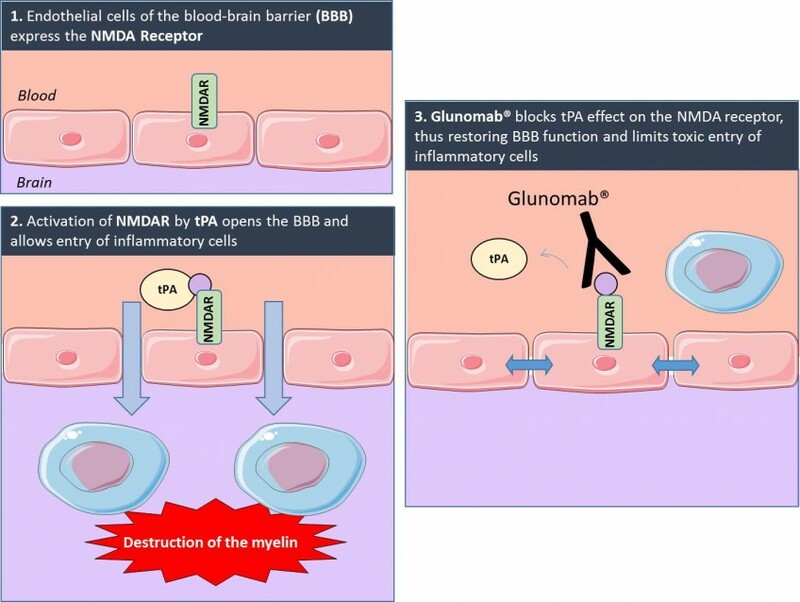 In the laboratory, they developed a monoclonal antibody (Glunomab®) directed against the specific site on the NMDA receptor to which tPA binds. In cellular models of the human blood-brain and blood-spinal cord barriers, the use of this antibody prevented opening of the barrier under inflammatory conditions, limiting the entry of lymphocytes. The team then tested the therapeutic effects of the antibody in an experimental mouse model of multiple sclerosis. After intravenous injection of Glunomab, the progression of motor disorders (partial or total paralysis of the limbs), as assessed by a clinical score, was blocked. In these treated mice, this effect was associated with reduced infiltration of lymphocytes into the nervous tissue, and reduced demyelination. By thus preventing myelin destruction by the cells of the immune system, this strategy might represent a promising therapy for the control of multiple sclerosis. A patent application has been filed on this work.